Global credit rating, Standard and Poor's, Moody's and Fitch, provide assurance of Colombia as a safe country to invest, by giving the country an investment grade. 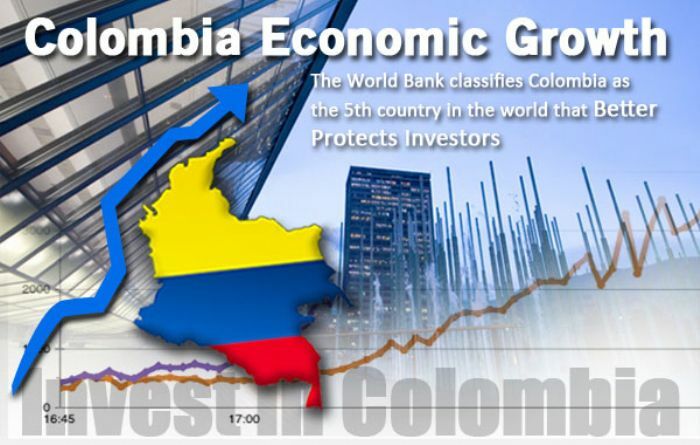 Similarly, the World Bank (Doing Business 2011) ranks 183 countries, Colombia between the fifth country in the world and first in Latin America how the country that most protects the investor. According to the report by The Independent in the UK, Colombia is one of the two new countries in Latin America with the best prospects for investment and development. additionally, Colombia is classified by the International Institute for Managment Development (IMD) as the second country in Latin America in areas such as personal safety and good protection of private property. With the most competitives Free zones in Latin America. Colombia offers Legal Stability Contracts that guarantee investment projects. In the last decade the average GDP growth in Colombia has been significantly above the world average. While world GDP decreased in 2009, the Colombian economy continued to grow in 2010 exceeded the expectations of global economic growth. According to the report HSBC on projections for 2050 compared to the growth of economies in the world, Colombia is among the top 30 positions in the standings. Colombia is the third largest in terms of population in Latin America with almost 47 million inhabitants, is the 24th planet's population, and the second largest Spanish-speaking world. Colombia has doubled in the last six years, its GDP per capita. 11 forward Colombia free trade agreements (FTAs) with 48 countries, achieving preferential access to over 1,500 million consumers. Since 2003, exports have tripled in Colombia. The Globalization Index 2010 Ernest and Young places Colombia in 3rd place in Latin America in terms of globalization, surpassing global economies such as Japan, Brazil, Russia and Indonesia. Colombia has 5 high-draft ports facing the Pacific and Atlantic that allow easy access to international markets. Colombia is located in the center of 5 zones and shares the zone with business centers as important as New York, Toronto and Miami. According to the International Institute for Managment Development (IMD), Colombia is the second country with the greater availability of skilled labor, with labor relations more effective and less labor regulations hinder business activities in the region. Additionally, according to a 2009 report by the PricewaterhouseCoopers, in Colombia is the most productive workforce in South America. This reflects the young and talented people, which offers professional 1,656,689 competitive labor market. Colombia has 5 submarine cables with a bandwidth exceeding 550 Gbps. Colombia is a country that exports energy, this internal energy enough to warrant large-scale operations. major cities have 100% coverage of fiber optics. Colombia is a country of investment opportunities differentiated by their nature of regions. Unlike other Latin American countries, Colombia has 10 metropolitan cities with populations exceeding 500,000. Thanks to the diversity of conditions (climate, flora and fauna, development, location, etc..), each region of Colombia offers different opportunities for the development of various sectors of the industry. Colombia is the greatest biological diversity and climatic zones. as Earth Trends, Colombia is the country with the highest diversity (plants, mammals and birds) per square meter. In Colombia there are over 50,000 known species, 36% of which are endemic, positioning it as the second largest country in the world floristic diversity. Colombis is located in the tropics, has a diversity of climatic zones with heights above sea level favoring the existence of various ecosystems, such as natural forests, savannah areas, drylands, wetlands, and other snow peaks. Cartagena is Colombia's most important port. Its industrial zones as Mamonal Industrial Park, Forest and Veal are their logistic support. In Cartagena de Indias has been experiencing a boom in the unstoppable construction for over 5 years. The sale of lots for housing construction.